Guest writer Bob is back with more thoughts to help you pave the way to playoffs success. Take a look at the data he's compiled and some trade suggestions that you might mull over. It’s that time of the Fantasy Football season where you have a pretty good idea of whether you will make the playoffs in your league or not. If you are still in the hunt, you may be doing all you can just to make the playoffs. That means choosing waivers that can help you this and next week. Some of them may be short term and subs for injured players. You don’t really have the luxury of looking at what your playoff lineup may be. And if you’re already out, well, meh…there’s always next year.But if you’re one of the fortunate ones that have already locked into the playoffs, GREAT! Now you have the benefit of planning for the playoffs a couple weeks out, and that can make a big difference. It gives you another week of waivers and a few days to make some trades before your trade deadline. This may be too late for some of you but most have until this Sunday. 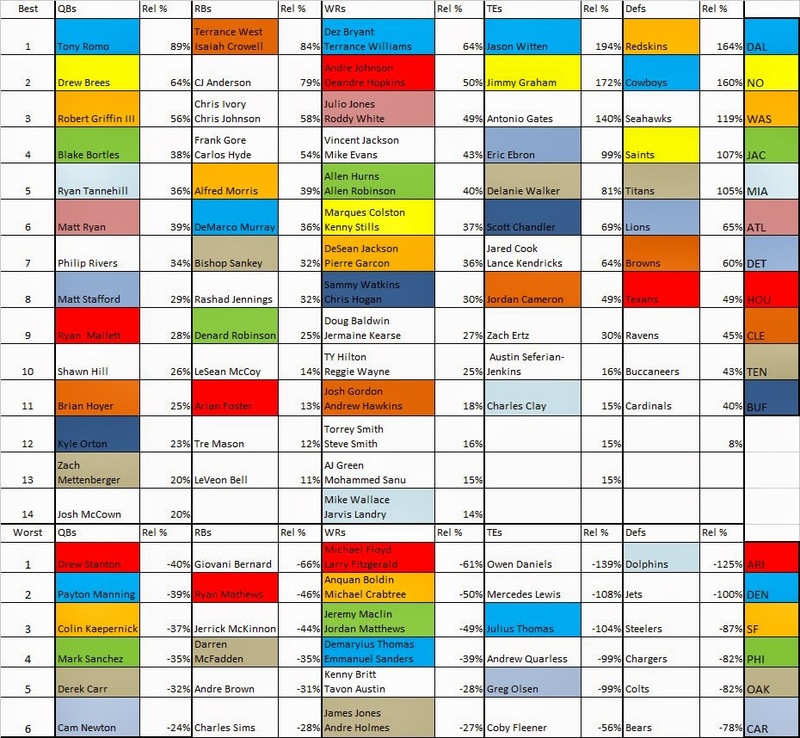 So this is when I accumulate as much data as I can on the matchups for the playoff weeks of 14-16. There are Strength of Schedule charts out there that I use to accumulate the best and worst matchups for all teams and players. For the chart below I derived the percentage of relative strength from FFToday. I usually don’t wait this long to use it going forward but the stats kept changing so I waited as long as possible leaving some time to make any strategic trades. Remember that these are combined strengths of opposing defenses for the weeks of 14, 15, and 16 only. A high percentage means a good matchup for the player listed. A negative percentage is a real bad set of matchups. Also, the percentage shown is a relative percentage with regard to all teams. So you will see the top matchups for QBs, RBs, WRs, TEs, and Defs. I also color coded some teams to highlight that they have multiple favorable matchups, which basically shows that those teams simply play the best schedule overall. So, for instance, Dallas looks like the team with the best matchups during the playoffs. Add to that, they will probably be in the hunt for the division, and that spells some big points coming for those players. New Orleans looks good too, except for running the ball. Cam Newton for Ryan Tannehill or Matt Ryan? Mark Sanchez for Matt Stafford or Brian Hoyer (remember the Gordon factor)? Jeremy Maclin for Julio Jones or Josh Gordon? DeMaryius Thomas for Dez Bryant? Colin Kaepernick for Tony Romo? Julius Thomas for Jason Witten? Greg Olsen for Delanie Walker? All of these trades are trading a player from the bottom 6 matchups for a player in the top five matchups. In this way you are getting equal talent with better matchups during the playoffs. And this will give you an advantage during the playoffs. So use this info wisely, it may be the best moves you make all year, and bring you that coveted prize of FF King or Queen!! !